In the event of an emergency we will contact the person above to notify them. If you have successfully completed general construction induction training more than 2 years ago. However, have not carried out construction work in the proceeding 2 years. You will not be permitted to commence work on a Blackwatch Site until your employer has provided you with new General Construction induction Training. If no, you can not commence work on this construction site until complete. Please include your WHITE CARD / BLUE CARD details here. Blackwatch Projects Pty Ltd is committed to ensuring the health, safety and welfare of its workers and any other people who may be affected by Blackwatch Projects Pty Ltd’s operations. In securing health and safety, this organisation will pursue best practice in OHS and to fulfil its statutory duties with regard to OHS at all times. Resources in terms of personnel, time, effort and financial outlay commensurate with the priority which the company places on occupational health and safety will be made available in order to: comply with all relevant legislation, and ensure the health and safety of workers and others who may be effected by BWP activities. Where necessary, external consultants will be engaged to ensure that health and safety is appropriately managed. This policy is regularly monitored and revised in the light of legislative, best practice or organisational changes. All visitors to the site must be accompanied at all times while they are on the Construction site. Persons visiting the site on regular bases will be required to complete and comply with Construction and site inductions. Only licensed workers or contractors who hold the appropriate certificate of competence may operate plant or equipment, or conduct activities for which a ticket is required. The BWP Safety representative will provide you with Site layout information on arrival on site. Remove yourself and others from any immediate danger. Sound the local emergency alarm to evacuate the area/building. Try to extinguish the fire (if safe to remain & equipment available). If unsafe to remain or unable to extinguish fire, leave the area. Be aware of the risk of smoke inhalation – crouch if you have to. Contain the fire by closing doors and windows as you go. Notify the Safety Coordinator of the location and size of the fire. Phone/have someone phone the emergency number 000 and inform the operator the FIRE & RESCUE SERVICE is required. Where the services will be met and by whom (if known). - E.g. Chemicals/Fuels Stored nearby. Site Phone No. /Mobile No. (If Available). NOTE: DO NOT HANG UP until told to by the phone operator. Quickly make the area safe then STOP WORK. While evacuating notify others you meet to evacuate. DO NOT RUN, MOVE IN A CALM AND ORDERLY MANNER. Proceed to the Site Assembly Area via the nearest safe exit. NOTE: In a gas release, move crosswind then upwind. Assist any injured or disable person to evacuate. DO NOT attempt to re-enter any building or plant areas. Report to an Area Warden (if absent appoint a substitute). Area Warden - Notify Chief Warden of persons present/missing. DO NOT leave assembly point without notifying Safety Coordinator or Site Manager. DO NOT return to the site until the ‘ALL CLEAR’ is given. REMAIN CALM - DO NOT HANDLE THE OBJECT. Immediately notify the Area Warden the size & location of object. Additional Hazards Involved (If Known) -. NOTE: DO NOT HANG UP PHONE UNTIL TOLD TO BY THE PERSON ANSWERING. REMAIN CALM - DO NOT HANG UP after the call is complete. Record all information on the checklist over page. Attempt to discretely alert persons nearby of the situation. Immediately notify/have someone notify the Safety Coordinator or Site Manager. ONLY evacuate the area/building if a safe path is available. Phone/have someone phone the emergency number 000 and inform the operator the POLICE SERVICE is required. CALL FOR HELP - REMAIN WITH CASUALTY IF UNCONSCIOUS. Ask for a First Aider or treat the casualty if First Aid trained. Danger - Remove all danger to yourself/casualty before starting first aid. Response - Check for a response from casualty (Shake and Shout). Airway - Ensure casualty’s airway is clear and open. Breathing - Look, Listen, Feel (If casualty not breathing give five  quick breaths). Circulation - Check casualty’s Pulse (If present start EAR, if not present start CPR. NOTE: See over page for further details on Basic Life Support procedure. Advise/have someone else advise the Safety Coordinator or Site Manager. o Phone 000 ask for the AMBULANCE SERVICE. o Details of Person(s) Involved - (If known). Site Phone No. /Mobile No. (If available)..
MOVE INDOORS/STAY INDOORS until the storm passes. Close all external windows and doors. If indoors DO NOT leave the building, it is safer inside. Move away from windows and external walls. Take cover under a sturdy object e.g. desk, doorway. If building is still intact after initial shock, REMAIN INSIDE. If an incident occurs as a result of the natural disaster, follow the appropriate Emergency Procedure from this manual. Notify the area warden of the location and size of the collapse/failure. ALARMS SOUNDS OR PERSON FINDS OR SUSPECTS A GAS LEAK. Quickly make the job/workstation safe e.g. place power tools on a bench/ground, ensure work pieces are stable/secured. Withdraw from the area moving crosswind from gas then upwind to the Site Assembly Point. If gas is present at Assembly Point No. 1 move crosswind then upwind to Assembly Point No. 2 or a gas-free area. As you leave notify others in the surrounding area to withdraw. Notify/have someone notify the Safety Coordinator or Site Manager. If not at an Assembly Point when 'ALL CLEAR' is given report to an Safety Coordinator or Site Manager at the Assembly Point before returning to site. A person conducting a business or undertaking that includes the carrying out of high risk Construction work must, before high risk Construction work commences, ensure that a safe work method statement for the proposed work is prepared or has already been prepared by another person. A safe work method statement (SWMS) is a step by step analysis of a task or activity; it is effectively a detailed risk assessment of a task and the method for its completion without harm to workers members of the public or the environment. 1)	A SWMS must be produced for all High Risk Construction activities e.g. Involves the risk of a person falling more than 2m. Is carried out on or near road, shipping lane, and railway, traffic corridor that is use by pedestrians or other traffic. An area, or attachable page for the team to sign off on once the pre-task talk has been conducted. All final subcircuits are protected at the originating switchboard by a RCD, which has a maximum rated residual current of 30 mA operating in all live (active and neutral) conductors. All is provided with overcurrent protection and a RCD. All switchboards are located so they are readily accessible and protected from damage. In multi-level buildings distribution boards are positioned in a manner that eliminates the need for flexible cords or cables to be run between levels. This requirement does not apply to work in lift shafts, stairwells, service shafts, formwork, external staging or submains of Construction wiring. Consideration is given to providing a separate residual current device for each final subcircuit to reduce the possibility of unwanted tripping. Power Distribution Boards must be heavy duty industrial quality and have individual switches for each power outlet. Double adaptors and piggy back plugs are not to be used at any time. Electrical work must be conducted by licensed, competent persons only and to approved design standards and drawings. Electrical work must only be conducted when the system is dead, using appropriate isolation procedures. Work can only be conducted live where there is no practical alternative, in which case a detailed risk assessment with appropriate controls is required. The potential for contact with, arcing or flashes from exposed high voltage electrical conductors or the presence of concealed electrical services will be identified and managed on the site with safe working distances and exclusion zones defined by competent personnel. Tested and tagged by a competent licensed electrician 3 monthly the prescribed intervals. Connected to the nearest power outlet and inspected for damage before use. Switched off at the point of supply and removed when not in use. In good condition, inspected and maintained at regular intervals. All electrical equipment is to comply with current Australian Standards (AS3012) and/or Statutory requirements. Scaffolding components, systems and erection methods are to meet current Australian Standards (AS 1576.1), relevant Codes of Practice and statutory requirements. Scaffolding with a working platform height up to 4.0 metres must only be erected by competent personnel with suitable documented evidence of experience. Scaffolding with working platform above 4.0 metres height must only be erected by personnel with the relevant scaffolding certificate of competency and authorisation for site. Personnel, unsecured equipment and tools are to be removed from mobile scaffolds prior to moving. Castors on mobile scaffolds are to be fitted with locking devices which must be engaged to prevent movement when the scaffold is in use. Access to work platforms is to be by approved (typically internal) ladders, stairways etc. Personnel are not to climb on the framing of scaffolds at any time. All work platforms are to be fully planked with handrails, mid rails and toe Company’s fitted. Scaffolding is to be designed and a structural plan prepared by an experienced, competent and qualified person to prevent structure failure. Copies of all plans and relevant documents are to be given to Site Management and kept on site. All braces, ties, handrails etc. are to be in place and scaffolding components are not to be removed or interfered with at any time by unauthorised personnel. All scaffolding is to be inspected prior to use and any defective components are to be removed from service and a suitable out of service tag attached. A "Scaffolding Certificate of Conformance is to be provided to Site Management by scaffolding providers for scaffolds above 4.0 metres working platform height prior to use. The Site Manager & Safety Coordinator will ensure that an inspection is conducted of scaffold integrity through daily site inspections. Portable and mobile work platforms must comply with the relevant design standards and have an up to date maintenance log available and checked prior to use. Harnesses, with lanyard attached to a suitable point must be worn in cages and knuckle boom EWP’s. Consideration for inadvertent operation of the controls must be given where overhead structures may come into contact with the control panel as the platform elevates (control panels should be guarded). A pre-start check should be conducted by the competent operator on a daily basis. Ladders are not to be used as a work platform, except when there is no practical alternative and the potential fall is less than 2m. In these situations 3 points of contact must be maintained. When using single/extension ladders: securely foot the ladder, tie off the top, set at an angle of 75 Degrees and ensure the ladder extends 1 meter beyond the level served. Ladders must not be used near unprotected penetrations and where they cannot be adequately footed to be stable. Ladders must not be used to support scaffold planks. Plant and equipment used on site must be appropriately maintained (in accordance with manufacturer’s instructions and codes of practice), registered and a pre-start check conducted prior to use to ensure it is safe. This is particularly important for plant such as cranes, concrete pumps/booms, earthmoving equipment, forklifts etc. Vehicular access and use of mobile plant must be risk assessed with controls documented on the SWMS prior to work commencing. Clearance zones will be barricaded to prevent inadvertent access to areas mobile plant is operating. Consideration should be given as to whether a stand by person is required to keep pedestrians clear of operating plant/machinery. Interfaces with public and other roads will be risk assessed and managed using barricading, accredited traffic control personnel etc. as deemed appropriate. Must be barricaded or covered to prevent falls into, or through, them. Trenches deeper than 1.5m must be battered shored or benched to prevent cave-in and must be barricaded to prevent people or materials falling into them. No digging or trenching work is to occur without a permit to dig Form 24 has been issued by the Blackwatch Projects Pty Ltd Site Management. The location of all services is to be known before the work commences. If however you find a tell-tale or unearth sand or some other fill stop digging and report to Site Manager & WHS Coordinator. Work at height is conducted in accordance with industry codes and Australian Standards. Only persons that have received training and are competent in working at heights will be permitted to conduct work at heights on the site. All work conducted where there is a risk of a fall, regardless of the height must be risk assessed with appropriate controls identified in the SWMS Note: for work at heights where there is a risk of falling 2m or more, or where work is within 2 metres of an unprotected edge with potential fall of 2m or more, specific control methods must be implemented. Implementing a fall arrest system. Where there is potential for a fall of 2m, or work conducted within 2 metres of an unprotected edge that may result in a fall of 2m or more, and there is no practical alternative a fall arrest system must be used. Environmental conditions e.g. Lighting, gas, oil etc. Condition of supporting structures e.g. Roof, ceiling, attachment points. When working on brittle roofs crawl. Fall arrest systems will be used where there is not safer alternative. The selection and use of PPE should always take into consideration outcomes of any Risk Assessment or SWMS that has been completed for the task at hand as additional PPE is required for some activities e.g. Use of rotating tools (high impact face shield), welding etc. SWMS must specifically state the type of PPE required. 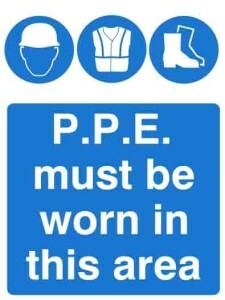 All persons using PPE shall be competent in its selection, use, fitting, maintenance, storage and disposal. All PPE must comply with relevant Australian Standards. Emergency Procedures and maps, Fire Wardens and First Aider names and photographs. Toolbox talks are conducted regularly by the Site Manager or WHS Coordinators or their delegate as a general means of communication to contractors involved with site works. They are designed to convey and exchange important Construction and project information. The agendas are to include reviews of recent incident reports, discussion of any incident or Safety alerts, hazards identified on previous shifts, review the contents of a SWMS prior to commencing a task, how a task will be conducted, what risks/hazards exist, what controls will be implemented and emergency procedures should something go wrong. The toolbox talk is a discussion with workers, encouraging understanding and participation. Workers should be encouraged to raise concerns or ideas about the job so that risks can be effectively managed. All workers must sign the SWMS as a record of the talk having been conducted and to indicate they understand the contents of the SWMS. The forum encourages participation in raising concerns and ideas and serves as a means of consultation between the Site Management Team and subcontractors. Changes to site procedures or systems are also communicated via this forum. All hazardous substances introduced to site must be accompanied by a current Safety Data Sheets (SDS) (< 5 years old) and approved for use by the Site Foreman/ Manager and the WHS Coordinator. A documented risk assessment using the SWMS must be conducted on the use of the hazardous substance prior to work commencing. The risk assessment is conducted using the SDS as a references and identifies risks associated with the substance for the proposed use and appropriate controls and any training requirement. The hierarchy of controls must be considered when proposing the use/purchase of a chemical i.e. can an alternative process be used to eliminate the chemical, or a safer product used to reduce the risk. b) Labelling: Containers and storage facilities must be labelled in accordance with relevant national standards and codes even when decanted. The labelling must clearly identify the substance, including relevant warning/hazard phrases. Labelling requirements are stipulated in the Australian Dangerous Goods Code. c) Storage: Hazardous substances should be stored in designated areas with consideration for ventilation, bunding and segregation from other incompatible substances as necessary. Except where specifically arranged contractors must take hazardous substances with them when leaving site on a daily basis. d) Spill Management: Proposed means for management of spills must be documented on the SWMS and appropriate spill kits for the substance and quantity available on site. e) First Aid: First aid arrangements consistent with those documented on the SDS must be in place (and documented on the SWMS prior to use e.g. Rinsing facilities, specialised treatment products. No Alcohol or illegal Drugs are permitted on any site under the control of Blackwatch Projects. Workers, contractors or visitors who are taking medication or receiving medical treatment that could compromise their Safety, or the Safety of others, have a responsibility to advise the Site Manager, WHS Coordinator & their supervisor accordingly. Manual Handling can lead to muscle and joint sprains and strains. Manual handing will be managed in accordance with legislative requirements, in summary: eliminating manual handling through use of lifting aids, minimising the load, following safe manual handling principles such as bending the knees and keeping the back straight and conducting team lifts. Manual handling risks must be identified and documented on the SWMS for all activities. Manual handling tasks, at the discretion of the Site Manager & WHS Coordinator will require a manual handling assessment to be completed. Details of the assessment will enable detailed risk identification with the findings and controls documented on the SWMS. Appropriate safe and clear access to, from and at the workplace for anyone working or about to work at the workplace. Each worker is responsible for ensuring that their activities are conducted with a high standard of housekeeping and that their worksite is clean, tidy and safe prior to leaving the premises. BWP conduct site inspections which include monitoring housekeeping as item 7 on the inspection list. Barricades, bunting, caution tape and warning signs must be obeyed and must not be interfered with. They are all used to warn of hazards and must not be removed or moved without the permission of the Site Manager & WHS Coordinator. Mobile telephones are recognised to be essential to the conduct business; however the hazards inherent in their use must be recognised and controlled. No mobile telephone is to be used to make or receive calls, or messages, when the user is working at height, in a confined space, operating power tools, mobile plant or any other form of equipment, or is performing any action where the use of the telephone may divert the user’s attention from the immediate task. Inspections will be conducted to verify system implementation on site and to identify areas for improvement. These inspections may cover a range of issues e.g. Daily Inspection or specific hazards e.g. Lifting equipment and Scissor lifts, housekeeping etc. The Site Foreman/ manager, the WHS Coordinator and the subcontractors foreman is responsible for Daily Worksite Inspections, verification of implementation of subcontractor SWMSs, and inspections of plant and equipment as it arrives on site as a minimum. Additional inspections should be conducted at the discretion of the subcontractor as relevant to the hazards present on site e.g. Electrical tools, hazardous substances etc. An incident and accident investigation form must then be completed, and where an injury occurred, an injury Report Form also completed. Incident data is collated into the Project Construction Report on a Monthly basis. Details about the incident must therefore be recorded on Incident, Injury and Investigation reports which are forwarded to the client. email the completed Incident Notification form to whsq.aaa@justice.qld.gov.au. Phone on 1300 369 915 (press 1 at the prompt) to be connected to WHSQ's after-hours messaging service. Your notification details will be referred to a WHSQ on-call inspector who will contact you within a timeframe that has regard to the seriousness of the incident. All statutory reporting requirements and timeframes will be complied with. Typically injuries resulting in 1 day off work are reportable to the Construction regulator, or incidents that had potential to result in loss of life. Basic first aid training will be refreshed every 3 years, and CPR training 12 monthly. First aiders must first protect themselves when administering first aid with gloves, Safety glasses and resuscitation masks as necessary. Anyone receiving an electric shock, or eye injury no matter how minor, must be taken to a medial practitioner for care. Records of first aid administered will be kept using the First Aid Treatment Register and Injury Report Form. Inspection of First Aid equipment will be conducted at least monthly using the First Aid Kit Inspection Form. Restricting times when noisy work is carried out, statutory quiet times are between 7pm and 6am, Monday to Friday and Noon Saturday to Monday morning. Maintained in an efficient condition; and Operated in a proper and efficient manner. Exposure to more 85dB for more than 8 hours can be damaging to hearing. As a general rule, when the noise is over 85dB you must raise your voice to be heard. Where noise cannot be reduced to a level which is non-damaging to hearing, A SWMS must be produced to enable work to be carried out in a safe manner. Hearing protection must be worn by those conducting and adjacent to the work. Hearing protection such as ear plugs and ear muffs must have the appropriate level of attenuation for the noise level, and be fitted correctly to provide protection. The Construction management team will identify the types of environmental impacts (risks) and aspects (hazards) that will be encountered on site. The Construction management team will comply with the requirements of relevant water quality/water way legislation, regulations and the requirements of local water authorities. Potentially hazardous activities, including washing out of concrete delivery vehicles, washing down of Construction plant are not permitted on site. It is a statutory requirement that generators of waste are responsible for the appropriate disposal, regardless of whether another party has been engaged to dispose of the waste on the company’s behalf. Blackwatch Projects Pty Ltd Australia Pty Ltd will only engage reputable waste disposal contractors, licensed by the relevant authorities to perform waste disposal. Waste management activities must be recorded on the Waste Register. Recycling is carried out wherever possible on site using segregated disposal containers e.g. paper, cans/tins/scrap steel, and glass. Lead acid batteries. Typical waste that will be generated on site is listed below. Appropriate containers and/or designated areas will be established on site, bins etc. provided will be emptied regularly to avoid spills/overflow of materials. The Site Manager and WHS Coordinator will ensure adequate waste management facilities are available and will check that SWMSs adequately address how contractors control waste they create. Avoid vegetation removal or damage where possible; preserve existing trees and grass etc. by barricading. Compost on site or arrange for removal by licensed remover. E.g. Waste oils and lubricants generated during maintenance, re-fuelling or due to spills/leaks. Maintenance of plant under most circumstances will conducted off site in appropriate workshop. Limited amounts of substances will be permitted on site and storage facilities with bunding provided. Spill kits must be available that are appropriate to the material and volume on site. Provide segregated bins for recycling of domestic waste e.g. aluminium, glass, paper etc. Engage licensed waste remover to collect for the duration of the project. Redistribute on site where possible in a manner consistent with site drawings or dispose of in a manner appropriate to the grade or contents of the waste. Solvents, batteries, detergents and vehicle wash-down water, hydrocarbon waste, waste water treatment plant sludge and residues. Regulated waste generated by subcontractors in most cases will be required to be removed by subcontractors from the site immediately. Where appropriate Blackwatch Projects Pty Ltd Australia Pty Ltd will provide wash-down facilities with appropriate treatment/separation systems. Where necessary Blackwatch Projects Pty Ltd Australia Pty Ltd will engage licensed waste removers to provide appropriate disposal services. The Construction project will comply with all statutory requirements governing air quality management. The Project Manager shall ensure that all its Construction facilities erected on the site of the Works are designed and operated to minimise the emission of smoke, dust, and other substances into the atmosphere. The Construction management team will employ Construction methods that will keep the air pollution to a minimum and apply measures such as those listed below to ensure that airborne pollutants do not cause undue disruption in the vicinity of the Works. The Site Manager will plan and execute the work so as to minimise the possibility of pollution of areas adjoining the Construction area, from contaminants such as petroleum products, trade waste, garbage and other noxious substances. The use and storage of any herbicide or other chemical classified as a poison shall be strictly in accordance with the manufacturer's instructions and the relevant Materials Safety Data Sheets (SDS). See section 10.3 for more details. Transporting, handling and storage methods that will prevent chemical, fuel and lubricant spillage on or around the site caused by Construction will be employed. Polluting or permitting pollution of any waterway by a chemical, fuel or lubricant, or any waste material is not permitted. Refuelling or maintenance of plant and equipment, or any other activity, which may result in the spillage of a chemical, fuel or lubricant on the site, is not permitted without appropriate temporary bunding being provided. Adequate quantities of suitable material to counteract spillage must be kept readily available. The Project Manager shall promptly notify the Client’s Representative and the EPA of any suspected or potentially contaminated ground exposed during Construction activities. The Site Manager will cease Construction activity in the vicinity of the suspected or potentially contaminated ground until it has been assessed and appropriate protection measures determined. The project will comply with relevant statutory requirements in relation to disturbance or treatment of potentially contaminated ground. The company shall install any control measures needed to divert surface runoff away from contaminated ground and to treat any surface runoff contaminated by exposure to contaminated ground. Contaminated material removed from site must be recorded on the Waste Register. Be verified/tested isolated prior to work proceeding. Danger tags will specify "Danger do not operate– Personal danger tag", the person’s name, date and time. Isolation will not be lifted until all tags/locks are removed. Relevant permits will be issued e.g. Confined space, penetration/excavation, heights, hot work etc. Faulty or damaged plant and equipment will be identified using an "out of service" tags and segregated to prevent use. The person who identifies the problem is responsible for attaching the tag. The tag must not be removed until the item is certified safe for use by a competent person. Where repair is not feasible the item will be disposed of by the owner to prevent re-introduction to the work. The out of service tag will state "Danger Out of Service – do not operate", the person’s name, date and the reason for the item being out of service. I certify that I have undergone induction covering the above points and have been made aware of Site Rules for the project. I also certify I have completed our Company safe work method statement induction, which I have signed to indicate my understanding.